When I was little the only after-school snack I ever requested from my mom was a quesadilla. I loved coming home and having crispy, cheesy goodness waiting for me. While I've expanded my diet since then, I still like to have a good ol' quesadilla every once in awhile. This recipe looks delicious! Plus, it's healthy! 1. Combine first 5 ingredients in a medium bowl. Divide chicken mixture evenly over 4 tortillas. 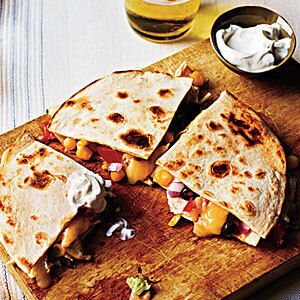 Sprinkle quesadillas evenly with cheese. Top with remaining 4 tortillas. 2. Heat a large skillet over medium-high heat. Coat pan with cooking spray. Add 1 quesadilla to pan; cook 1 minute on each side or until golden. Remove from pan, and repeat with remaining quesadillas. Serve with sour cream.